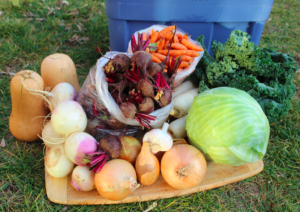 2019 Fall CSA Boxes: Now’s The Time To Sign Up! 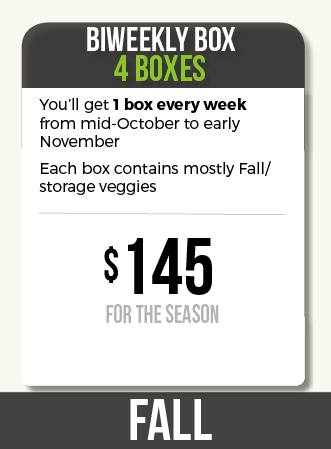 You want to extend the season and get our organic veggie boxes from mid-October to early November? Sign up now for our CSA Fall boxes. We also offer summer CSA boxes! Another great perk is that we’ll also send you our weekly e-newsletters during the season so you’ll get all the latest news from the farm, as well as our favourite plant-based recipes to savour the bounty even more! Freshness-wise, you can’t get this quality from the grocery store. It’s a great deal! * If you did not sign up for our 2019 summer box, your box price will include an additional mandatory contribution of $ 18 (+ taxes: $ 2.70). This contribution will be forwarded to the Family Farmer Network to provide a variety of services to member farms and make Community Supported Agriculture known to the public. We have many drop-off points, in Outaouais and in Ottawa. As a CSA partner, you simply have to choose the one most convenient for you. It usually only takes partners a few minutes to pick-up their veggies. We highly recommend bringing your own reusable bags and containers to bring our harvest home with you. Gloucester (new! ): 4478 Harper Avenue (near Gloucester Centre), between 5 pm-8 pm. Orleans: 3712 Innes (at Kardish Health Food Centre, Innes Rd between Mer Bleu Rd and Orleans Blvd), between 4:30 pm-8 pm. Parkdale: 729 Gladstone (at Seed To Sausage, west of Bronson), between 3:30 pm-6:30 pm. Parkdale: 750 Gladstone (at Pressed, one block west of Seed to Sausage), between 3 pm-6 pm. Buckingham: 746 Av. de Buckingham (at Fines et Fûtés near the Jean-Coutu/SAQ), between 1:30 pm-7:30 pm. Gatineau (Du Versant District): 470 Gréber Boulevard (at Brûlerie Charlemagne, at the corner of Saint-René), between 2:30 pm-7:30 pm. Gatineau (Mont-Bleu area): 774 Saint-Joseph Boulevard (at Brûlerie Aladdin, west of Autoroute 5), between 3 pm-8:30 pm. Lochaber-Partie-Ouest (at the farm): 829 Rang 4E Ouest, between 4-7 pm.